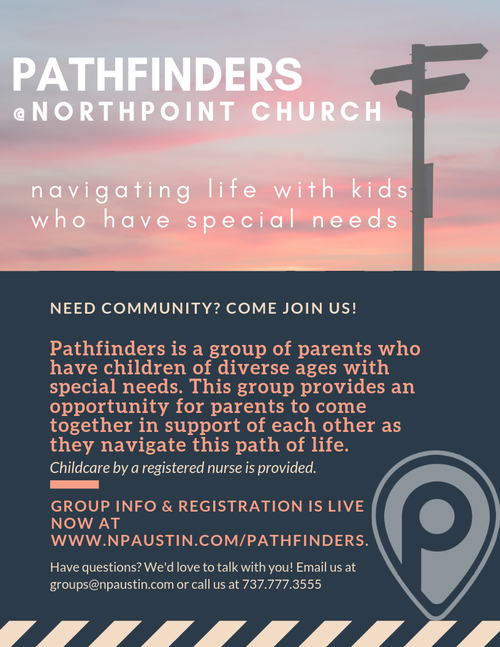 Pathfinders are parents of children who have special needs and who are navigating new and different roads for their children and for themselves. This group provides an opportunity for parents to come together in support of each other no matter where you are on the journey and no matter what type of special needs your child has. To find out about our next Pathfinders group, use the button below to sign up for our waitlist. Want to spread the word? Download this PDF. You can print a copy and hand-deliver or send digitally! If you are new to Northpoint and would like to know how we care and support children with special needs in our environments, please email us. We'd love to talk with you!